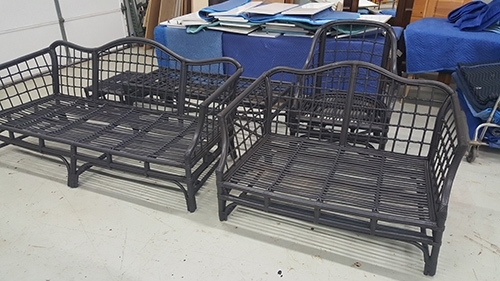 Outdoor furniture adds functionality and comfort to any outdoor area and turns it into a great place to socialize, relax, and enjoy fresh air and natural beauty. Wood furniture, in particular, makes the best addition to an outdoor space – it is a natural product that blends in with the surroundings and brings a lot of charm and warmth to the ambience. 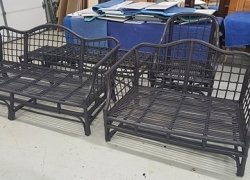 However beautiful and comfortable outdoor wooden furniture may be though, it is likely to lose much of its appeal within just a couple of years out in the elements. 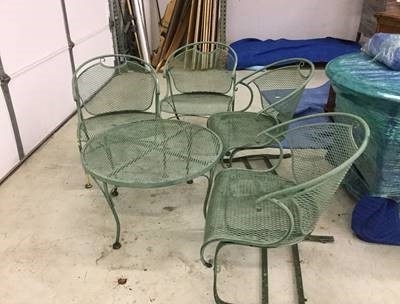 Rain, snow, ice, intense sunlight, extreme heat and freezing cold take a big toll on outdoor furniture, marring its surface and stealing its luster. 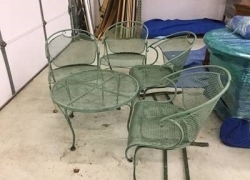 Yet, you don’t need to replace your wood patio table or bench just because it is sun-bleached or a bit grimy – as long as a furniture piece is in good structural shape, you can easily restore its beauty and shine. All you need to do is refinish your weathered piece. Let the furniture dry completely before proceeding. It is also a good idea to hose down the furniture with a power washer or high pressure hose – this will remove not only dirt and debris, but flaking paint as well. 2) Sand the wood. Sanding will assure an even surface that will properly accept the new finish. Start with 120-grit sandpaper to remove any remaining finish and even out imperfections in the wood, then smooth the whole piece down with 220-grit sandpaper. Alternatively, you can work with an orbital sander and use sandpaper only for hard to reach areas. Either way, make sure you sand along the grain of the wood and be careful not to sand too deeply and damage your furniture. When ready, wipe all the surfaces with a tack cloth to clean off any dust from the sanding. Take safety precautions – Refinishing wood furniture is a messy job that may present considerable health hazards unless you take appropriate precautionary measures. You’re advised to work in a well-ventilated area, such as an open garage or a patio, and wear rubber gloves, safety glasses, and a dust mask to protect yourself from harmful chemicals, noxious fumes, dust, flying debris, and other risks. Never work near an open flame as stains and stripping chemicals can easily ignite. Also, don’t forget to put large drop cloth or tarp on the floor of your work area and cover any nearby items to prevent stains and facilitate cleaning after the job is complete. Repeat the process as necessary – you may need to apply multiple layers until you get the desired result. Just make sure you wait for the paint to dry completely before applying the next coat and lightly sand the wood between coats. The final step in your outdoor wood furniture refinishing project is to protect the paint from the elements. When the final coat of stain is fully dry, wipe the furniture surfaces clean, and apply a thin layer of appropriate outdoor sealant. Wait for it to dry, sand the furniture with fine-grit sandpaper to make the surface smoother, remove any dust from the sanding with a new tack cloth, and apply a final layer of sealant to ensure the best possible protection to your furniture. Let the wood cure for a couple of days before putting your refinished furniture back to use. 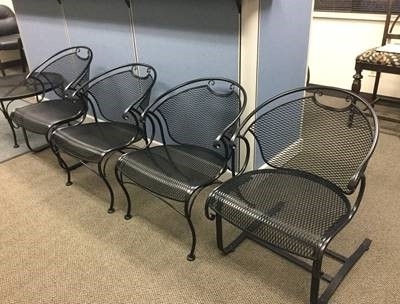 Do not leave wet and freshly finished patio furniture outside to dry though – dirt and debris from the air may settle into the new furniture paint and result in unsightly specks. To prevent this, you need to keep your repainted furniture indoors – in a shed or garage – until it dries. If you have teak patio furniture, you can easily restore its color and luster by rubbing it with teak oil (after it has been thoroughly cleaned). 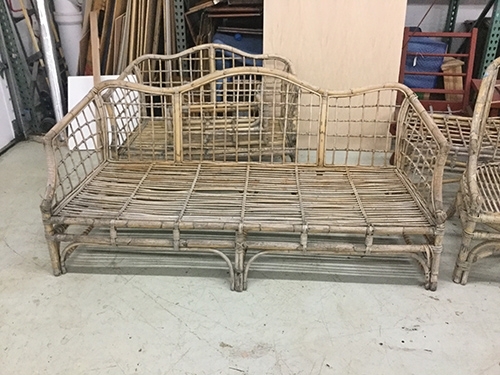 You can also sand the piece to remove the dark patina, strip the worn out outer layers of the furniture, and reveal the golden-brown of the teak. Either way, it is a good idea to use a teak sealant to protect the wood from weathering. 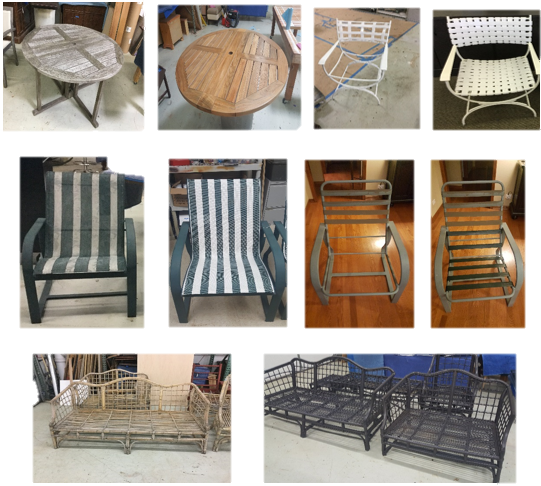 Now that you know how to refinish outdoor wood furniture, you can decide if you’re up to the task or not – it’s very satisfying to bring your weathered pieces back to life yourself, but the process is laborious and time-consuming. 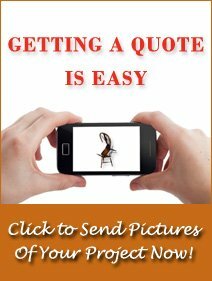 It can be very complex too, especially if your patio furniture is more intricate or has sustained some kind of damage. 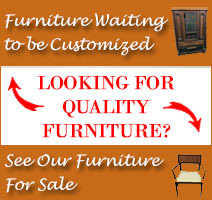 Wood furniture repair is better left to the professionals. At Furniture Medic by MasterCare Experts, we have the specialized equipment, rich experience, and technical know-how to complete the job in the safest, fastest, and most efficient way possible. 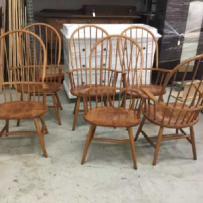 So, if you’re in need of wood furniture restoration in the Carol Stream, IL area, do not hesitate to call us – our skilled craftsmen will effectively restore the natural beauty and strength of your worn out pieces.